When Jesus sent the disciples out to preach and heal, he sent them “two by two” (Lk 10:1). Today we have that same calling to go out and spread the Good News by virtue of our baptism, and we find people responding, intentionally and with enthusiasm, to that calling. This includes all of our lay evangelists setting up stations on the street, and also more recently, those who have accepted the call to be religious brothers with the St. Paul Society of Evangelists. “The brothers from the St. Paul Society of Evangelists attended “The Mission: Flint Summer Work Camp” during the week of July 22-27 at St. Mary Queen of Angels in Swartz Creek. 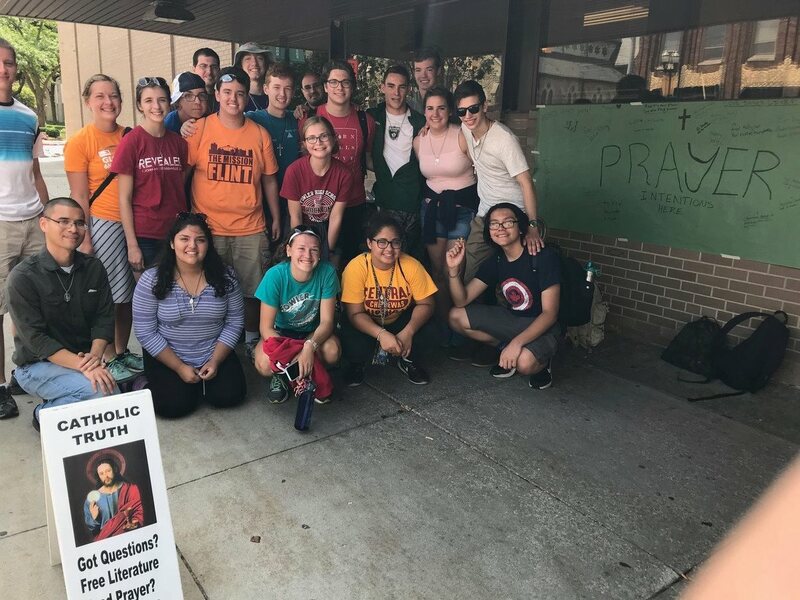 There were over 100 youth and young adults from different parishes in the diocese of Lansing who were assigned to various community service projects, one group of which was assigned to do street evangelization. The brothers gave a training conference on Monday which was based on the Basic Evangelization Training days given by SPSE, but with the fun factor kicked up a notch for the teens. Topics included the importance of prayer, how to approach and engage others in conversation, how to hand out Miraculous Medals and Rosaries, how to pray with people for their intentions – especially for physical and spiritual healing, and how to give the Gospel message and encourage them to take the next step in their journey to God. Eager to set the world on fire, the group of 15 high school students, several young adult leaders, and the three brothers set out after Mass on Tuesday morning to the Flint courthouse. Two were stationed at an SPSE table while the rest were locked and loaded with pockets full of medals and Rosaries. After a prayer they broke up into teams of 2’s and 3’s and were sent to evangelize on the main street and surrounding area. What happened next surprised us all. 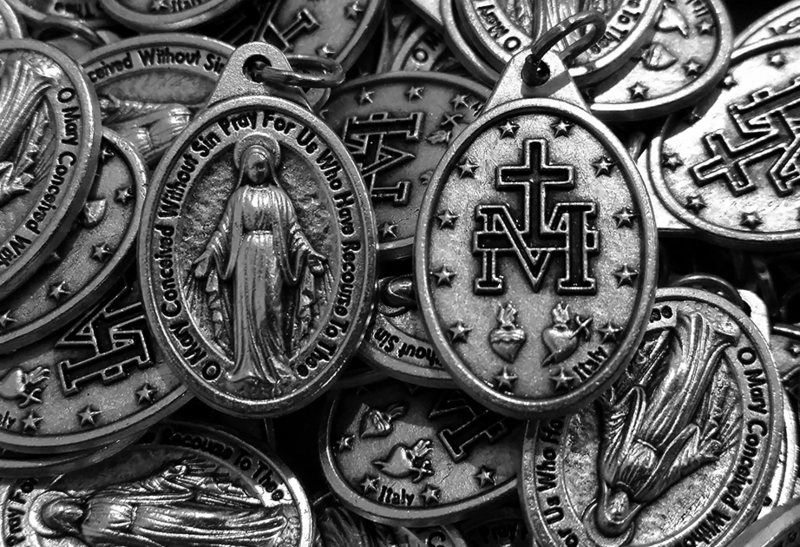 Teams began to come back to the SPSE table to refill their hands and pockets with more Miraculous Medals, Rosaries, Crucifixes, cards, pamphlets, and whatever else they were inspired to give away. Reports of fruitful conversations, inspired prayers, and confidence among the students began to increase, especially those who were street evangelizing for the very first time. As the day passed, reports of people having personal encounters with Jesus increased. People were receiving spiritual healing while others were being healed completely of their physical pains. The Gospel seed was increasingly being sewn into hearts. Praise be Jesus Christ! Have you ever felt a deeper calling to do something “more?” Do you want to “go beyond Sunday” to be on fire as a “24/7 Catholic?” Are you attracted to the religious life? Maybe God is calling you to consider the St. Paul Society of Evangelists! Praised be Jesus Christ! 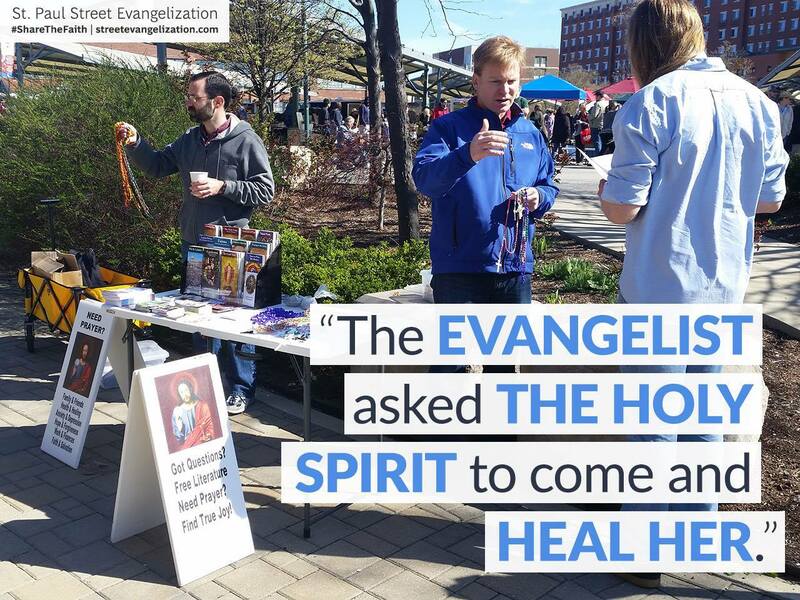 A team of evangelists visited the local Farmer’s Market to share the Gospel on a recent Saturday. There were a handful of remarkable encounters on this outing, but one of them, in particular, stands out. One of the team’s evangelists met a young couple. They were Protestants striving to live their lives for Christ, but not strongly committed to one denomination. The evangelist gave them “One good reason” why he chooses to be a Catholic: That Jesus Christ founded the Catholic Church, and promised to remain with it until the end of time. As he explained this to them from the Scriptures, the couple were very responsive, and truly interested in discovering the truth of this for themselves. They accepted the tract, “Pillar of Fire, Pillar of Truth,” and the books “Rome Sweet Home” and “Made for More,” and promised to read them. They also exchanged contact information with the evangelist, planning to meet him on another day for lunch. As they were walking away, the evangelist had a thought, “I should pray with them!”, and he ran to catch up with them, asking if they would like to receive prayer. They accepted, and he prayed that the Holy Spirit draw near and fill them all. The couple was visibly moved by the prayer. Now, this evangelist had discerned in the past that he had been given a gift for prayers of healing, so he asked the couple if they needed prayer for any physical ailments. The young woman said that yes, indeed, she suffered from lymphedema, an incurable condition effecting the lymphatic system. She said that her pain-level was currently “20 out of 10,” and that her ankles were swollen. The evangelist asked the Holy Spirit to come and heal her from the condition, and commanded the pain to leave and the condition to be healed in the Name of Jesus Christ. The woman stood up, and was amazed, saying that the pain was 100% gone! She started crying as she wiggled her ankles which were no longer swollen! Praised be Jesus Christ! Please give thanks to God for His kindness to this young woman and her boyfriend, and pray for them and for the evangelist, as he follows up with them. This couple, married 57 years, stopped by our SPSE table at All Saints Soup kitchen today. The layout of this Catholic Charities of Southeast Michigan run soup kitchen has our evangelists near the entrance. As patrons check in, they can see our table. Our evangelists greet them as they wait in line. Following check in, patrons can enter the dining area by passing directly in front of our table or by another route. This gives our evangelists the opportunity to evangelize or perhaps simply to make eye contact with as many that enter as possible. I washed it and it feels good.” She was opening and closing her hand repeatedly. Praise Be to God! Sometimes God sends people your way when you expect it, but most of the time he sends people unexpectedly and we just need to remember to Listen, Befriend, Proclaim, and Invite. When we are open to listening and asking questions, we can touch hearts through our love of God and our neighbor. We then asked him about his relationship with God and if he went to church. He said that he had grown up Catholic but had drifted away from the church. He couldn’t even remember why, he just stopped going. He told us that sometimes, he just walked into the local Catholic Church when no one was there because it gave him a sense of peace. We shared with him that being in relationship with God and following his plan for our lives can bring us that sense of peace always and that God wants to be part of our lives. God created the church so that we would be part of his body and we would live in community with each other. We prayed for his needs and gave him a Miraculous Medal. We talked to him about how much God loved him and his face lit up. We were able to connect him to our contact person at the church to begin the process of accompaniment back to full relationship. When one member of the body of Christ falls away, it is a loss for us all. How many people are out there that need this same kind of love and conversation to help restore their relationship with the Lord and His Church? You can be the hands and feet of Christ. Come and partner with one of our teams or start one in your own community. Doing street evangelization we encounter many people with many problems. We live in a post-Christian, pagan culture, broken by sin and weighed down by misfortune for many. We need more fools for Christ! The Holy Spirit gives you courage to be a fool for Christ. Any ordinary Catholic can do it, you just have to ask for the grace and He gives you the words. We are merely getting out there and planting seeds, the Lord makes it grow if it is His will; He is the Harvestmaster! I joined up with the Lower Bucks County team for the day. 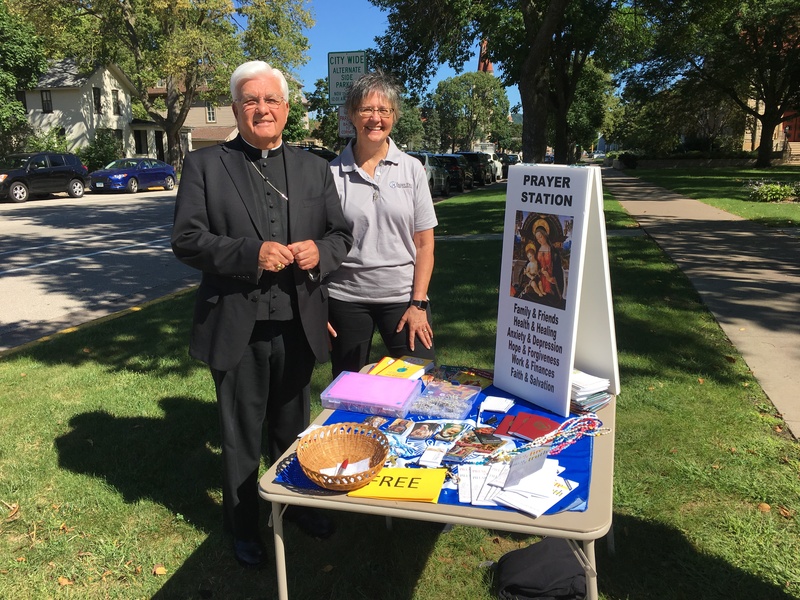 Since there were four of us we split into two teams; Nancy and Don set up shop near the cathedral on the Parkway, and Deacon Mark and I set up outside the children’s hospital. Our first encounter was with a young Catholic nurse from the West Indies who moved here from Ohio, who listened thoughtfully and said she had been thinking of going back to church. I gave her a rosary and St. Michael medal, and encouraged her to go to Mass and to Confession. She seemed to really take it to heart. Her name is Ima, please pray for her. In another encounter, I walked over to a woman who seemed troubled, and sat down next to her and introduced myself. She was Catholic but non-practicing; her daughter was in the hospital we were set up in front of, and she also had a relative who committed suicide recently. She seemed generally touched that someone would pray for and listen to her, and considered it God’s doing. I gave her a Miraculous Medal, saying how much it has changed our lives, and also a rosary with instructions on how to pray it. Her name is Kristen, and her daughter in the hospital is Savannah. Pray for her. Lastly, I asked a man if we could pray with/for him and he was very suspicious because we were Catholics and said, “You are a stranger, and it’s not good.” He was a big man. But then he seemed to have a change of heart and said, “sure.” So I prayed with him. Then he asked if he could pray for me and I said sure, which he did. Then we chatted and I smiled at him the whole time and it seemed to disarm him. He agreed we have a fight on our hands, but I told him it is not with each other, it is with the culture. Then we hugged. He even left, then came back and gave us $5, which we will use to buy more holy medals! His name is Jeff, he is a Baptist minister, please pray for him as well. Praised be Jesus Christ! Like Saint Paul, even if we can “save some” or at the very least pray and be a comfort for those who need it, we are doing the Lord’s work and being his hands and feet. Nothing gets done without the Holy Spirit. But when He is there, watch out! "In the Face of Awful Hardship...Joy"
This story comes from Nancy of the Philadelphia – Lower Bucks County team. 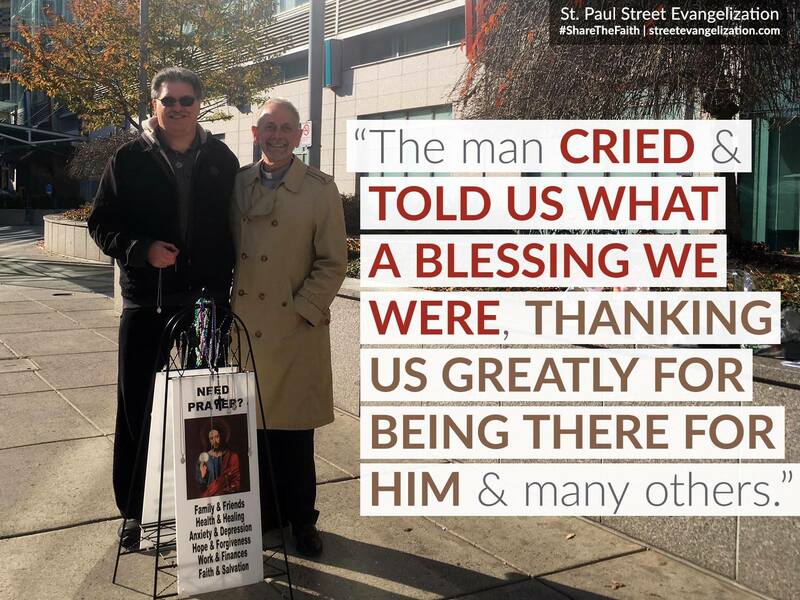 Walking out of the Children’s hospital parking garage on a chilly but sunny day of December, Deacon Mark, Don and Nancy immediately happened upon Thomas on the sidewalk leading down to the street. This poor man, catching a smoke, was obviously in great anguish, given away by the pain in his eyes. Our little team had been walking and chattering from the car ride and seemed to most unexpectedly meet up with Thomas. Noticing Thomas by himself, and upset, we asked if we could pray with him. There was no hesitation in this man, he seemed to have no doubt of needing prayer, no strangeness that these people passing by asked to pray with him; it seemed like he knew just why we were passing him by at that time. Thomas’ little six-year-old daughter Anisa is in the Children’s Hospital and has suffered and continues to suffer with multiple brain tumors. Thomas, a strong tall man, stood in tears and fear for his little girl and his dear family. The poor man beseeches Our Lord to hear and answer prayers for Anisa. We pray for good diagnosis, appropriate and effective treatment and full healing of Anisa and we pray for strength, hope, peace and love of Our Savior to fill Thomas, his wife Rebecca, and little Anisa this advent particularly, and always. Following our prayers with Thomas, we walked on down to Civic Center Boulevard and up 34th street to setup our prayer station between the hospitals. Just on our way out from Mass earlier about an hour before, we had requested prayers from a couple of longtime parishioners, Al and Ann, at OLGC who promised to pray for us. They thanked us for doing this ministry and hugged us, saying they would indeed pray to God to place people in our path who need help with knowing Christ’s love for them and pray for us to have the words that are pleasing to Our Lord that these people need to hear. In answer to their prayers and ours, we met many people on our two hour mission. One thing that is always striking about doing St. Paul street evangelization in front of the hospitals is how many people on what seem like normal sunny days are suffering with tremendous burdens in their lives. It is an honor and a privilege to be allowed by them and by Our Lord to minister to them in their time of great need. Thinking on how one person’s normal day is another person’s upside-down day is reminiscent of all the recent Gospel readings leading up to advent, not knowing the time or the place, but knowing one day we all shall see the face of God. Until then, being reminded by others of His constant working in our lives is where a person in the face of awful hardship can have hope, peace and hopefully even glimpses of joy in knowing they are never alone, but God is always with them, and that this life is not all there is, and that God sends His body of Christ, us, to minister to those in need. After praying with and for many, listed below in intentions, our little team packed it up to leave. Walking down the street to head back to the car, we saw a couple of laundry bags on the wall. We asked a man standing near if he would like a blessed medal. He told us indeed he did want one, and prayers also. His name was Bradford and he was waiting for his wife Lucy to pull up her car to get the laundry. The clothes were Amanda’s, Bradford’s 26-year-old daughter who was dying in the hospital from pulmonary hypertension. Bradford told us that he saw us and thought of coming up and asking for prayer, but felt he could not, feeling unworthy and weak to do so. He remarked how glad he was that we passed by him and asked. He was so thankful to pray with us, remarking on how his daughter always told him what a strong girl she was but that now her time had come. Bradford had great concern for his daughter to be received into heaven when she passes. We prayed the Fatima prayer at the end of our prayers with him: “Oh my Jesus, forgive us our sins, save us from the fires of hell; lead all souls to heaven, especially Amanda and all those in most need of Thy mercy.” The dear man cried and told us what a blessing we were, thanking us greatly for being there for him and the many others there. Praise be to God for He is great and His mercy endures forever! Praised be Jesus Christ!